Liz and Danielle are two of my most beloved nerdy gal pals, and when it comes to girls nerding out, two of my truest wing gals! If I could name my Ride-or-Dies in the Rebellion, I’d have these Jedi flying the X-wings next to mine as we race to battle The Empire, First Order, or any other entity out to vanquish intergalactic peace. After a rough day at work, I was on the fence about trying to make the Orlando version of the Kessel Run during rush hour, but they did what friends do best: tell me I am going because I’ll regret it if I missed out. The Force and FOMO is definitely strong with me! Liz & Danielle are a couple of my favorite nerdy ladies in a galaxy not-so-far away! I worried that I arrived too late when I got to the Barnes & Noble on Colonial Drive and saw copies of the new book rapidly diminishing before my eyes! I nearly bought multiple copies in case my friends didn’t get there in time! What I love about fan events like these, is that people do their best to ensure everyone has a great time. Fans wore their best Star Wars gear1 and of course a fantastic group of cosplayers visited including Darth Vader, Boba Fett, a couple of Stormtroopers, and possibly the cutest Jawa ever! I get giddy when I celebrate fandom. I’m not ashamed of it either! 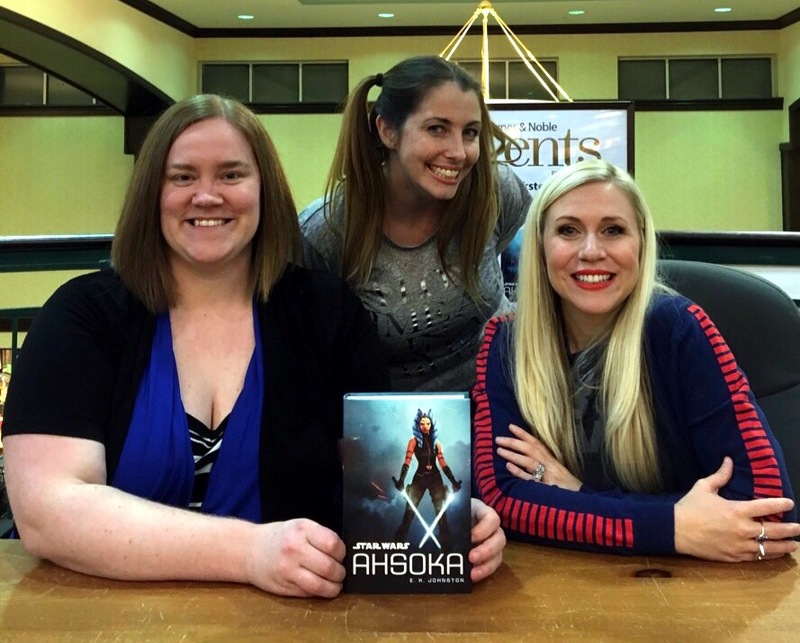 The signing event featured AHSOKA novel author E.K. Johnston and the incredible fangirl responsible for bringing the voice to Ahsoka Tano to life, actress Ashley Eckstein. The event started at 7PM, but with the large turnout, EK & Ashley stayed well past close to ensure each and every fan had the opportunity not only to nab a signature and grab a quick photo, but they carved out time to talk individually to each and every person in attendance! Meeting EK & Ashley made adding this book to my library extra special! The biggest question surrounding the novelization was asked and answered during the opening of the event: “Will this book be considered part of the Star Wars canon?” The enthusiastic short answer– an emphatic YES! The Star Wars universe is quite large, but unfortunately, many of the previously released novels are no longer a canonical component of it. I am so glad that AHSOKA is part of it because its a pivotal work for two incredibly talented women. This beautiful hardbound edition signed by both EK & Ashley will look great in my library. It had been ages since I went to a book signing, especially one that involved queuing for several hours, but I am so glad that my gal pals coaxed me out of hiding. Not only did I have a wonderful night out, but I was able to meet some of my friends face to face for the first time, too! That was where he was wrong. Ahsoka wasn’t weaponless. It has been over ten years since I’ve picked up one of the Star Wars novelizations, especially since many of the ones I had read were relegated to the alternate universe upon Disney’s purchasing of the franchise. Reading AHSOKA and experiencing her story on the run in devastating wake of Order 66, finally gave me the push to watch both animated series of The Clone Wars and Star Wars Rebels. Although one of the primary focal points of the Star Wars series is Darth Vader, the added catalyst of Ahsoka’s relation to Anakin Skywalker, provides another layer of incredible storytelling within an expansive universe. Johnston approaches Ahsoka’s post-Clone Wars path akin to Obi-Wan, one on the run and the constant conflict of forging alliances and friendships. Her moral compass and desire to remember her Jedi training results in complications of her anonymity when Imperial troops find their way to the outskirts where she’s determined to hide. Ahsoka is presented with a critical decision: run or fight. Leading into the holiday season, the book laid dormant until I headed to my parents’ house for my weeklong vacation between Christmas and New Years. It was promptly vanquished in several days over countless cups of coffee on the veranda. Like many of the other Star Wars novelizations, Johnston brings a diverse universe alive without smothering the plot in unnecessary detail or extraneous dialogue. Her description of Ahsoka’s life on the run makes me want to learn as much as I can to understand her struggle thoroughly. Her storytelling leaves me wanting more, and hoping that Johnston will have the opportunity to continue weaving tales in the Star Wars universe, especially with relation to Ahsoka! Have you ever been to a book signing or a special release event? How familiar are you with the story of Ahsoka Tano within the Star Wars universe? Do you have any rituals when reading a book? One of my favorite mugs accompanied me on my journey across the galaxy! My outfit: Star Wars for Kohl’s burnout T-shirt with silver text, hand made tiered skirt of a Tie Fighters & X-Wings, a green cardigan with a Rebel pin.